Are Oklahoma Veterans ‘Unlikely to Survive’ the Mental Health Crisis? Leave it to Oklahoma legislators to put on a show when it comes to the state’s mental health. At the 2016 Governor’s Veterans Services Symposium, Governor Mary Fallin padded the state’s mental health crisis with good old-fashioned Oklahoma fluff. We have increased access to mental health and established the Oklahoma Suicide Prevention Council. As she stood to speak on behalf of the men and women of my state who have served this country and those we have lost, I was angered and insulted on behalf of every Oklahoman who struggles with mental health, especially our veterans. The lives of our loved ones depend on the changes Oklahoma politicians create. Do they really think we do not notice when doors are open or closed or when we invest more in our roads than we invest in the people who pay them to stand in that office? Trust me, we notice when our veterans sleep on the street. What Governor Fallin meant by “increased access” is that Oklahoma House Bill 1697 was passed, permitting her to sign the Labor Commissioner Mark Costello Act into action. What she meant to do was pat herself on the back. Meanwhile, those receiving state-funded services through the Oklahoma Department of Mental Health and Substance Abuse are at risk of being legally compelled to shove pills down their throat. Whatever happened to that “recovery-oriented” approach? Yet, if the original House Bill 1697 had been passed, every Oklahoman who struggles with mental health would have lost the right to live a “self-directed” life and make their own healthcare decisions. That right based on a few flexible words, which leave Oklahoman vulnerable. I struggle with mental health. I also currently receive state-funded mental health services. When Oklahoma cuts nearly 24 million dollars from the state’s mental health budget within six short months, leaving more than 73,000 people without access crucial life-sustaining services, it makes me concerned about survival. Not just for myself, but also for 23,750 Oklahoma veterans living below the poverty line and depending on the state’s mental health services to help them survive. So, let’s get real about mental health and stop mucking around! We cannot afford for our Governor to cover up the blood our veterans have spilled, just so her political agenda and reputation stay sound. We also cannot afford to regulate mental health changes introduced by former government officials driven by the grief of losing a child; no matter how tragic it was (or how heartless I sound!). Treatment works if you can get in the door. Yet it seems like the only people who are “unlikely to participate” in treatment are the very people who should be opening should be opening that door. Taking control away from those who receive or are in need of mental health and substance abuse services does not increase access to care. Consumers who receive mental health services will be more unlikely to communicate when there is a crisis or they are in need of higher-level services, out of fear of state-controlled treatment, rather than recovery-based, trauma-informed care. It sends the message to those waiting for help or in need of care that if they get involved with the Oklahoma Department of Mental Health and Substance Abuse Services, they might be deemed “unlikely to survive” and forced into state-controlled psychiatric care. It silently exposes incarcerated individuals to the possibility of misuse or abuse by law enforcement or other court-appointed officials in charge of behavioral health services while under state care. The Costello Act sends a message to those who do not struggle with mental health about those of us who do. It sends the message that people with mental illness are dangerous, unstable, and should be reprimanded and feared. We should absolutely be concerned that the suicide rate is going to begin to climb back up again in Oklahoma. The Oklahoma suicide rate already surpasses the National average by nearly 5 percent. One in every five suicides is someone who put his or her life on the line to fight for our country, to fight for this state, and to keep us all safe. So, I just want to say to the leaders of this state, how many more lives will be lost while you feed us lines about increased access to services you are cutting state funding for? I say not one more! Rise up, Oklahoma. It is time to secure our survival. What Would Jesus Say to Leelah Alcorn? In my last blog, I wrote a response to a Christian Blogger who had posted a public response to my thoughts about Leelah Alcorn. This morning, I just wanted to add one quick thought. What Would Jesus Say To Someone Like Leelah Alcorn? 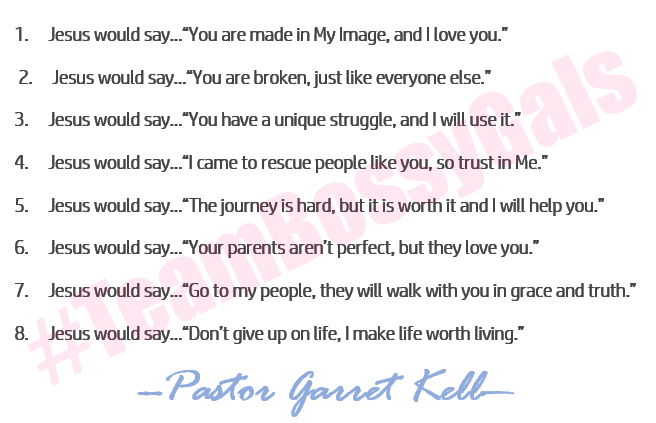 Pastor Kell said it best. We get so distracted by religion and judgement, we stop showing our love. It’s dangerous and deadly. And I can’t help but notice how the devil sure does look a lot like people.